Chronic venous insufficiency is caused by higher-than-normal blood pressure within the leg veins. This may be due to blood clots or phlebitis (swelling and inflammation of the veins). Blood clots in the legs (called deep vein thrombosis) can damage the valves in the veins. When people get chronic venous insufficiency after a blood clot, it may be referred to as post-thrombotic syndrome. When it occurs after phlebitis, it may be referred to as postphlebitic syndrome. 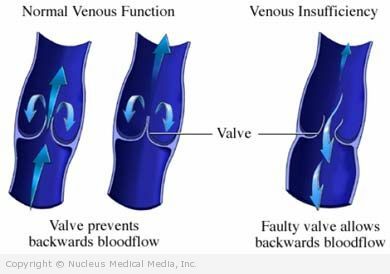 Chronic venous insufficiency can be caused by blood clots, which can damage the valves in the veins. A risk factor is something that increases your chances of getting a disease or condition. Duplex scanning (venous ultrasound/ Doppler) — An ultrasound is a test that uses sound waves to examine the inside of the body. In this case, the blood flow in the veins in your legs is evaluated and the presence of a clot can be detected. Venogram (x-ray of the veins) — An x-ray is a test that uses radiation to take a picture of structures inside the body. In this case, dye will be injected into a vein in your foot, and several x-rays will be taken. Elastic support — Your doctor will prescribe special elastic stockings that squeeze the veins in the legs and keep the blood from pooling. Elevation — Raise your feet and legs above the level of your heart while resting or sleeping. Your doctor may ask you to do this several times a day. Exercise — Your doctor may encourage you to walk and to do specific exercises for your legs and feet. Mineralbath therapy (balneotherapy) — This treatment may help to improve symptoms, even in advanced cases of chronic venous insufficiency. Movement — Avoid long periods of sitting or standing. If you go on an extended trip, get up and walk or flex your leg muscles every 30 minutes or so. Skin care — If you have a skin ulcer, your doctor may use bandages (Unna boots) and/or apply an antibiotic cream to help prevent infection. Wearing compression stockings may also promote healing. Sclerotherapy — This treatment involves injection of a caustic material into the malfunctioning veins. Scar tissue fills the veins, and the blood is rerouted through other, more functional veins. Over time, your body will resorb the vein. Ablation — A tiny electrode is inserted into the malfunctioning vein, and electricity/heat scars the vein, blocking it off. As with, sclerotherapy, your body will resorb the nonfunctional vein over time. Vein stripping — This involves the removal of the faulty vein. Bypass surgery — A new length of artificial vein (a graft) is connected to two areas of the malfunctioning vein, in order to allow the blood flow to bypass the area that is not working. Avoid prolonged standing or sitting. Avoid wearing restrictive clothing such as very tight girdles or belts.